Obituary – Goss, David Louis « Perry High School Alumni Association, Inc.
Jr. Play Committee 67-68; Wrestling 66-67. 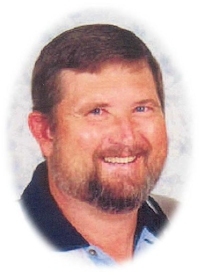 David Louis Goss, 53, of Perry, Oklahoma, was the son of C.C. and Virginia Elizabeth Sherrard Goss. He was born on March 18, 1950 in Cherokee, Oklahoma and died on January 16, 2004 in Perry, Oklahoma. David married the former Claudia Timm on April 3, 1987 in Perry, Oklahoma. He was a surveyor with the Oklahoma Highway Department until he retired. He was a member of the YMCA, where he was a lifeguard, and the First Baptist Church. A memorial service will be 10:00 a.m. Wednesday, January 21, 2004 at the First Baptist Church. Kent Ritchie will officiate. There will be a private family burial. Services are under the direction of Brown-Dugger Funeral Home. Memorials may be made to the Oklahoma Medical Research Foundation for Mental Health in care of Brown-Dugger Funeral Home. 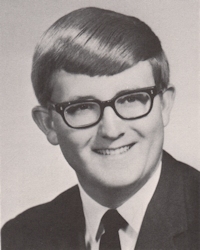 David is survived by his wife Claudia Goss; three step-sons, Rick Kimbrell and his wife, Ronna, of Wichita, Kansas, Mark Kimbrell of Enid, Oklahoma and Mathew Kimbrell and his wife, Lisa, of San Diego, California; one daughter, Ammie Bryant and her husband, Jefferson, of Stillwater, Oklahoma; seven grandchildren and one sister, Jeannie Ebersole and her husband, Sam, of Perry, Oklahoma.